The Sam Waller Museum would make an excellent setting for an iSpy book. The founder, Sam Waller, coined himself a Pack Rat and called the museum a “Clutter-torium” – a nickname that was certainly no exaggeration. Over the span of his lifetime, Sam Waller accumulated a mass array of unusual oddities for his museum, where he hoped to “portray life as it once was once the distant past”. But beyond being a collector, Sam Waller was a skilled naturalist, taxidermist, museum curator and a teacher. Here is just a small sampling of the oddities you will see in what is sometimes known as, “The Biggest Little Museum of the World”. The two-headed calf is one of the most popular and perplexing specimens at the Sam Waller Museum. Born locally on the farm of Sid Wilton on April 6, 1950, the calf was born with two heads, fused at the base of the skull. In total, the animal had 4 eyes, 2 brains and 2 ears. Weighing only 55 pounds, the calf lived for a short time – but it was not alone in its unusual birth defect. Just a year later, a similar calf was born in Plumas, Manitoba, with another born more than 20 years later in Edmonton. The calf now resides mounted at the Sam Waller Museum behind plexiglass, to protect it from those who wish to pet it. Have you ever attended a flea wedding? It’s quite the occasion. Sam Waller’s dressed fleas incites a great deal of curiosity from visitors and for good reason – very little information is known about the origins of this bizarre artifact. Research supports the theory that they were originally from Mexico, possibly gifted to founder Sam Waller. There are five pairs of fleas in total, with three dressed as brides and grooms. The Museum Curator and Archivist shared a funny tidbit with me about when she first started at the museum and was told it was her job to put the fleas in their pajamas each night. Thankfully, for her sake, they seem perfectly comfortable resting in their current outfits. This artifact blends the familiar with the unusual; a standard Remington typewriter with Cree Syllabics instead of English letters on the keys. The typewriter was used by the clergy of the Archdiocese of Keewatin in The Pas, Manitoba in the early part of the last century. That’s a mouthful of alliteration, isn’t it? This specimen is no ordinary American alligator, having little to no pigmentation. Upon first glance, the yellowing colouring may indicate the animal was leucistic rather than albino, but it’s also possible that the colouring is due to some treatment applied to the surface of the specimen. These types of alligators are very rare, generally only seen in captivity since a lack of camouflage makes it difficult for albino or leucistic alligators to survive in the natural wild. Today, there are only about twelve living white alligators in captivity. This Chinese water pipe was likely produced and used in the late 19th and early 20th century to smoke tobacco. And while it’s certainly possible that it was obtained overseas, the most likely scenario is that it was imported to North America. The cloisonné is an ancient technique for adorning metalwork objects, formed by making compartments on the object by soldering thin strips of gold and silver. The compartments formed are filled with materials and colours to create an image. The pipe was donated to the museum in 1974. There’s just something glamorous and intriguing about the history of flight. This artifact holds significance in Manitoba’s flighty past, having been previously owned by Tom Lamb, founder of Lamb Airways (or LambAir), a charter airline based out of The Pas. Incorporated in 1935, the airline’s motto was “Do not ask us where we fly…Tell us where you want to go”. The airline was managed by Tom’s six sons and played a vital role in the development of Northern Manitoba. Did you know that over 3,500 suborbital flights were launched from Fort Churchill? Now deserted, the Fort is a Canadian National Historic Site; with remnants like this artifact left to remind us of a different time in Manitoba’s history. The rocket would have been used in Churchill between 1968 and 1970, reaching a height of 65 kilometres with 9000 Newtons of force. If there’s anything that has gotten exponentially better in our lifetime, it’s dental work. Dental artifacts from the past are a little frightening, even when they are simple denture shade guides. This guide was produced in New York in the first half of the 20th century. Dr. Harwood had a practice in the 1950’s at 130 Edwards Avenue in The Pas, Manitoba, and it’s very likely that he was the dentist that used the guide to match crowns to existing teeth. The item was discovered in a garage of a pawnshop before being donated to the Sam Waller Museum. 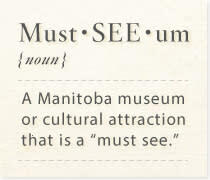 The Museum is located in the historic Community Building and Court House at 306 Fischer Avenue in The Pas, Manitoba and is open year-round, 7 days a week, except Statutory Holidays (Open Canada Day & August Civic Holiday). Regular Hours: 1:00 p.m. – 5:00 p.m.
July & August Hours: 10:00 a.m. – 5:00 p.m.